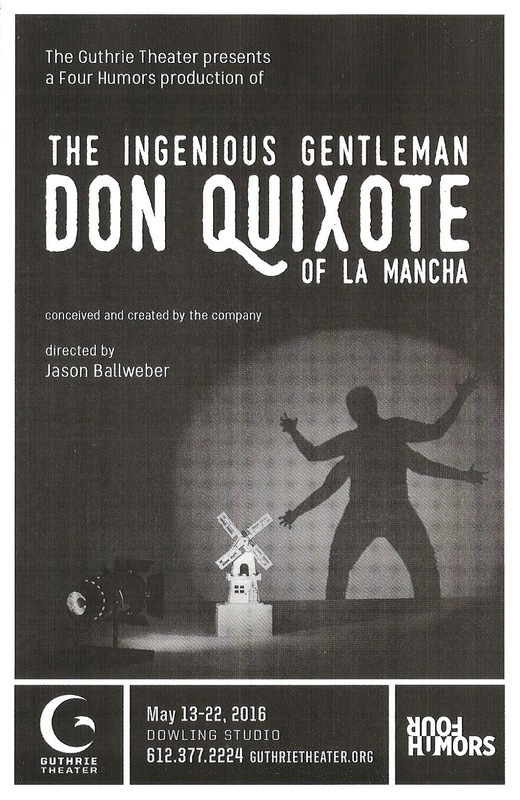 When the ingenious gentlemen of Four Humors apply their unique, clever, and hilarious storytelling style to a classic such as The Ingenious Gentleman Don Quixote of La Mancha, it's a thing not to be missed. And even though I've experienced many such unique adaptations by Four Humors, as well as original work, last night's world premiere opening night still gave me something unexpected. 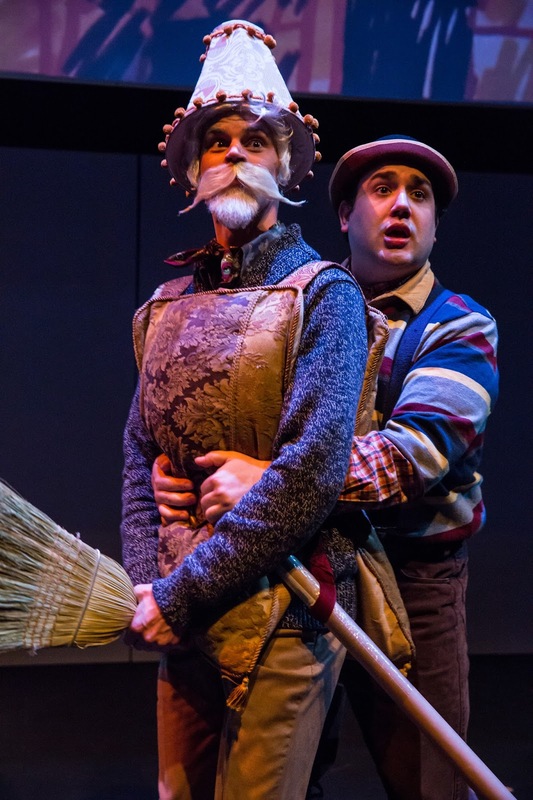 As the play points out, everyone knows Don Quixote, even if you're never read the book or heard the name Miguel de Cervantes (as for myself, I've only seen the musical adaptation Man of La Mancha, natch). Four Humors tells the classic story about honor, chivalry, and madness in a unique way using puppetry projection (and thereby possibly inventing a new art form?) 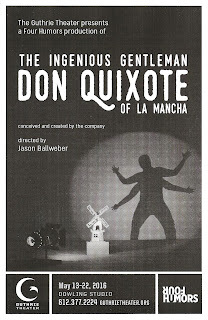 and by making Cervantes a character in the play, allowing the characters to step outside the story and comment on it. 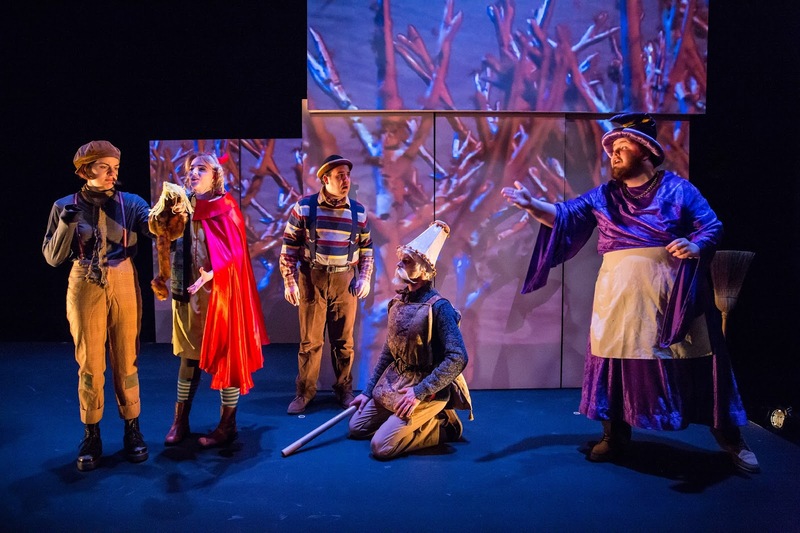 I believe this is Four Humors' debut at the Guthrie, which will no doubt expose a new audience to their often accomplished mission "to create art that celebrates the humor, stupidity, and beauty of our world by letting the artist connect with the audience in a vulnerable and honest way." All five of the Four Humors (they're artists, not mathematicians) had a hand in this piece, with help from many of their talented friends. Nick Ryan is credited as the lead writer, with assistance by the other four company members Jason Ballweber, who also directed, and Ryan Lear, Brant Miller, and Matt Spring, who also play roles in the play. Ryan is of course Don Quixote (completely committed to the character's unfailing belief in his imagined world); Brant is of course his trusty sidekick Sancho Panza (adorably hilarious, as always); and Matt is Don Quixote's professor nephew who unwillingly becomes caught up in his world (showing a nice progression from sane to crazy). Other standouts in this huge cast of 13, many of whom play multiple roles, include Dario Tangelson as Cervantes, bringing us into his story; Elise Langer as the not as glamorous as Don Quixote believes Dulcinea (who, along with Christian Bardin, also supplies some lovely music); Andy Kraft and Andrea San Miguel as a couple of ridiculously uptight royalty; and Nick Saxton as the straight man in this crazy world. Almost all of the ensemble members take turns manipulating the puppets and projections, which are located in view of the audience to the left of the stage. Eight white panels like blank canvases line the back of the stage (the black box studio set up as a traditional proscenium), which are moved around by the ensemble and upon which the images are projected. 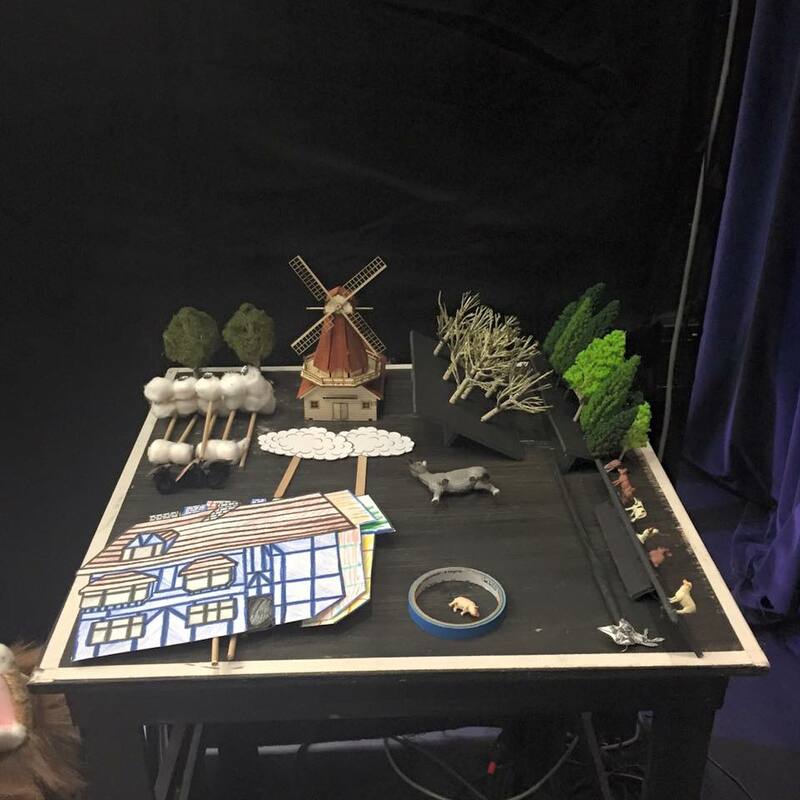 There are at least three cameras, one with sometimes hand-drawn backdrops, and two with moving or stationary puppets representing horses, sheep, trees, or other objects. 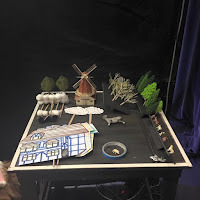 The whole thing is immensely complicated, in terms of coordinating which images are projected onto which areas of the stage, but it has a charming sort of DIY feel, as you can see the hands manipulating the puppets and sometimes things don't go quite as planned. It's a bit clumsy at times, but it totally works with the "hey, we're putting on a show!" vibe, continued from before the show when the actors walk through the audience introducing themselves and chatting. There's no pretense here that this is anything other than a great big fun game of make-believe. Don Quixote is an old and well-known story, but there's a reason it keeps coming back in different forms. It's an appealing tale about a man who believes in his ideals and stands up for what he believes is right, no matter what anyone says. Four Humors brings this story to life in a fresh and delightful way with a clever adaptation, talented ensemble cast, and innovative puppet and projection design. With just over a week of performances, this is a short run, and judging by the full house last night, tickets might be hard to come by. So make your plans now to see this new adaptation of a classic.